Houston may be known as Space City, but we love our trees just as much as we cherish the stars. With neighborhoods such as The Woodlands and Kingwood, "the livable forest," there's more than just a few Houston suburbs lined with large, native trees. Of course, as sturdy and eternal as these trees seem, they're actually in a delicate balance with their surroundings. For any number of reasons, including storms, disease, pests, and others you may need professional help to maintain your trees' well-being. On the other hand, pervasive roots and above ground obstruction may also cause the tree to become undesirable. So exactly what tree services are offered in Houston? The most common Houston tree service is tree removal, but Houston tree specialists offer a wide range of services. They can help save a diseased or damaged tree. They can give you a written estimate for what a damaged tree was worth for insurance or tax credit purposes. And they can help advise you on planting new trees. 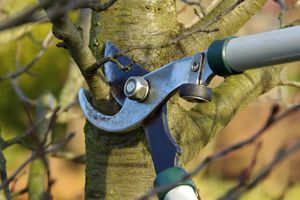 For dead growth or simply aesthetic shaping, specialists can prune your trees with a doctor's eye to the health of the tree and a hair dresser's eye to branch shaping. Removing a large or even a medium-sized tree is a big enough project just from a physical and logistic perspective. Felling a tree is not easy, is far from an exact science, and even experienced tree professionals have known to get hurt. Plus, for trees near your house, risk to the house is also always imminent. That said, tree contractors have gotten really good at their profession and your biggest obstacle may very well be bureaucratic. Many neighborhoods have local ordinances protecting trees. This can work against you when you're trying to remove a tree, although many homeowners find protection from these ordinances when their neighbors attempt to force you to remove your tree. If you do decide to remove your tree, talk to the contractor about chipping the branches into mulch instead of hauling it away. Also, make sure stump removal is included for the project. Often, tree removal and tree stump removal becomes two separate projects with varying costs. HomeAdvisor matches homeowners with any home improvement contractor you can imagine. We gather information for all these services, including tree service in Houston. Our national data tells us that the national average for tree removal costs or trimming services is $750, and we see a similar average in Houston with a catch. The cost of a tree service project varies widely from as much as $1,500 to as little as $200. Naturally, this range depends considerably on the nature and the extent of your tree service needs. But not as much as you might think. While you should always get multiple quotes for any home improvement project you're considering, feedback from Houston homeowners tells us that they often find a quote that's considerably less than competitors who still provide quality work. The easy part about tree removal is that once you've hired a contractor and obtained a permit, the actual project usually doesn't last longer than a few days, if that. Weather may play a role, but rarely do you experience any extended inconvenience from having contractors working outside your home for several days. In fact, while kitchen and bathroom remodels often take longer than a homeowner would wish, homeowners more frequently find that contractors leave too early. When hiring a tree contractor, make sure you check references that the job was completely finished and after the job was done, your yard was returned to its previously manicured state. Comment: 3 trees with branches overhanging roof - need trimming. Houston Tree Services are rated 4.79 out of 5 based on 3,938 reviews of 156 pros. Not Looking for Tree Service Contractors in Houston, TX?